Home » All Posts, Projects, Writing	» What the Dickens? I’m a Novelist! Unless you are a bit geeky, you may not want to continue to read from this point on. I thought it would be fun, yeah geeky fun, to analyse my month’s writing. 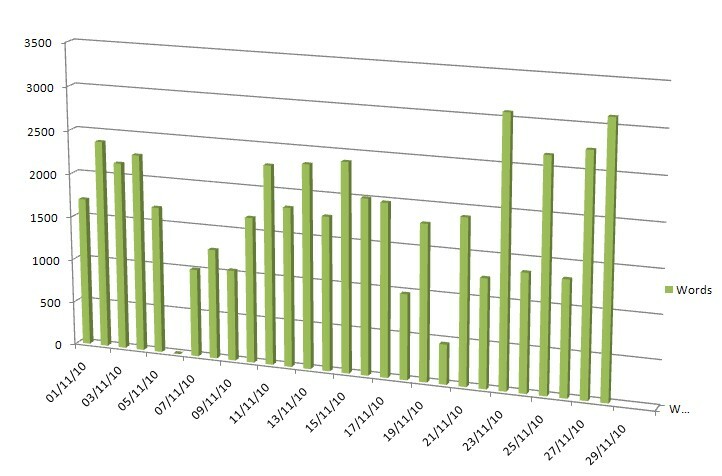 You may be aware that the NaNoWriMo site provides you with a graph to chart your progress, so from day to day you can see if you are on target. Of course you can identify from this graph when you have stalled or had bursts of creativity, but since the overall trend and focus is on the daily target line, it’s not always apparent how you have done from day to day. Hence, sad person that I am, I whacked my daily word count totals into a spreadsheet and came up with this. It tells me that there was only one day this month that I didn’t write a single word and I had a good excuse for that one. I spent all day doing Tarot readings at Witchfest. The interesting thing for me is that I thought I had been fairly consistent from day to day, but the graph suggests that I seesawed around the daily target from one day to the next, getting more extreme in the last week. I must admit that once the finish line was in sight, I was staying up until 2am some night if I was on a roll. woooohooooo! Go us! I have to say that I did find it an utter chore. Next year – for we WILL do it again – I’m going to get my research out of the way BEFORE I start writing. I’m sure that will help lol!